Tired of having pins fall off your bag? Sick of getting stuck in the head with those metal clasps? Grab some locking pin backs or rubber backs and put an end to those annoyances! PVC Rubber pin backs. 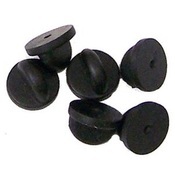 Great for use when wearing pins on a hat, these will not hurt your head the way standard butterfly clasps can do. These backs do not have any sort of locking mechanism, but they do grip the pin post well. Sold in packages of 10 backs. If you're like us, you take pride in your pins and losing a prized pin is an unthinkable horror! Well rest easy, Our Pin-Locks will guard your pins from being lost. Simply replace the standard clutch with a Pin-Lock and your pin is permanently mounted. Great for use on hoodies, shoulder bags, backpacks or anywhere you want your pin permanently displayed. Each package contains 12 pin loks with an allen wrench. Please Note: BE CAREFUL when using these backs. The torque created when tightening the allen screw can bend the pin post, so don't tighten it too hard. It is possible to bend or even break the pin post if you apply too much force when tightening the screw. I use them regularly and have no problems as long as I am careful when tightening the screw.